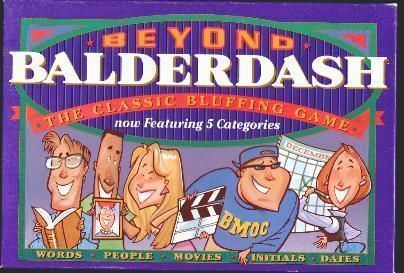 Beyond Balderdash is the expanded second edition of Balderdash. Balderdash is based on bluffing your opponents into guessing your false definitions to obscure words. Beyond Balderdash adds several new categories to the mix: Movies (make up a plot), Dates (say what happened on it), People (say what the person did), and Initials (make up what they stand for). The real answers are often even more outrageous than the bluffs, so the game offers plenty of laughs.